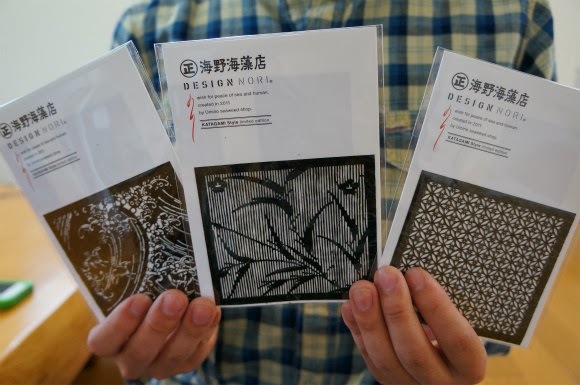 Laser-cut with beautifully intricate patterns, Design NORI is the award-winning creation of Umino Seaweed Shop and ad agency I&S BBDO Tokyo. Not only is the nori unique in design but it's composition is made of "seaweed from the Sanriku area of Miyagi (the northwestern coast of Japan’s main island)... [and] is thick, has luster, and is very delicious. It doesn’t stick and it enhances other ingredients". While it's not readily available for purchase, I'm told Umino keeps their Facebook page up-to-date with product info: www.facebook.com/uminokaisouten (it's in Japanese and may not be accessible on all computers).